I have been reading books about Georgia O'Keeffe lately. I had a fascination with her work and life way back when I was getting my undergraduate degree in fine arts, and lately, for some reason, I have returned to her story. Nearly forty years have passed since I last thought seriously about her work, and I find that there is a richness there that--though I loved her work even then--I didn't see before. The books I've been reading--a wonderful, comprehensive, and scholarly biography by Roxana Robinson, and books on O'Keeffe's houses and clothing--have given me much to think about. I'm still processing it, and don't know where it is leading, so there is no point in talking about it just yet. But I have also been using this time to work on a painting of Hesperaloe parviflora (Red Yucca) in which I pay homage to one of her later paintings, "The Winter Road." Accordingly, that is what I have named this painting. I think a pilgrimage to Abique is in order. I have never seen her work in person...would love to. There was a wonderful Georgia O'Keefe exhibition at the Tate Modern in London a couple of years ago. As well as her wonderful paintings, there was the bonus of many of my favourite Stieglitz's, Weston's and Ansel Adams' photographs that I'd studied for A Level photography. It's amazing to think how she and her contemporaries in that group were so ground breaking at the time. 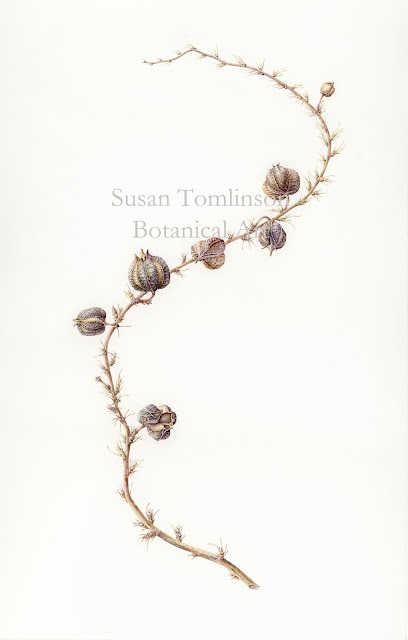 Hey Michelle, I’m working on a longer blog post about her (and botanical art) today. Look for it today or tomorrow! So sorry I am not going to be able to see you and Gail, and the other in Austin!